Bring comfort and style into your bathroom with this Uphome Soft Shaggy Bathroom Rug. The Soft Shaggy design adds fun and flair, livening up most any space. This Uphome rug is soft to the touch and constructed to absorb water quickly. It is made of 100 percent microfiber polyester, making it soft on your feet, and it features a non-skid, no-slip backing for helping keep it in place as you towel dry. This rug is machine washable for easy care. Use the versatile Uphome Microfiber Rectangular Soft Shaggy Rug in the bathroom, kitchen, office, or bedroom. 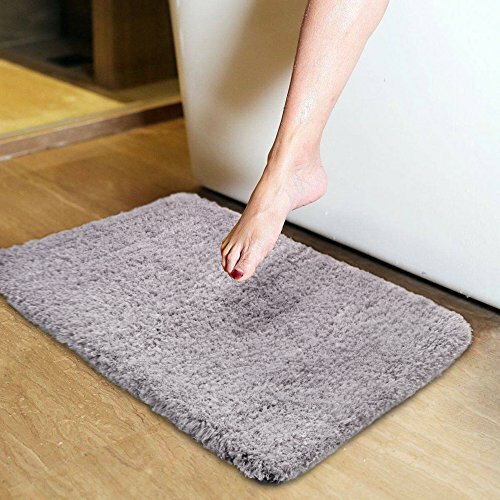 [Uphome Design] -This elegant bathroom rug made of 100% microfiber polyester and anti-slip TPR backing adds extra protection for elders and babies, features a classic Plain Color, which can blend with any existing home decor. [Multiple Sizes and Match Choice] This bath rug available for all spaces in your home: 17 inches by 24 inches, 20 inches by 33 inches, 2 Ft Round, 18 inches by 48 inches. You also can search TAPESTRY and SHOWER CURTAIN in our store to find you prefer one. [Satisfaction Guarantee] Take Uphome bath rugs to your home to give your room a vivid look. If you have any problem or suggestion, please kindly contact us, we provide support for you within 24 hours.